Scene of the Blog Featuring Lucy of The Reading Date! 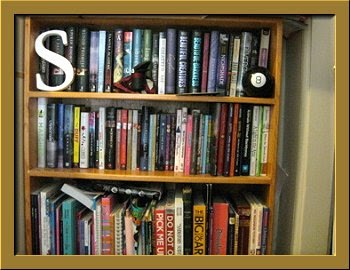 This week's featured book blogger is Lucy, whose blog The Reading Date is just over a year old. This Californian likes reading Young Adult and Adult fiction, especially the Dystopian, Contemporary, Paranormal and Historical subgenres. Lucy's family is full of readers, and it's not unusual for her to share some of her books with her daughter (who's been known to share her opinions of a book in a review or two). I hope you take the opportunity to visit Lucy at The Reading Date. Don't forget to say hello while you're there! And if you're here visiting from Lucy's blog-- Welcome! I hope you enjoy seeing Lucy's creative spaces as much as the rest of us! I know Lucy's ready to give us a tour, so let's get started! I do my blogging from a desktop computer in the "office" room of our house. 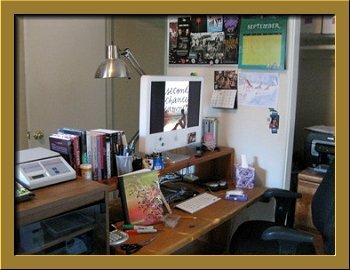 My daughter inherited my laptop so I'm making due with blogging from our desktop computer and occasionally my phone. Sitting in my comfy office chair I have my review notebook close at hand and a stack of current books to review. I also keep shipping supplies and a postal scale nearby to ship giveaways and such. 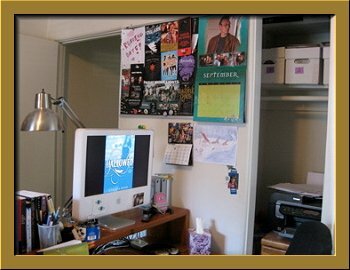 This area is usually cluttered but I seem to work around it OK.
Can you see Lucy's swag board? Another view of my blogging space where you can see my swag board. We have small bookshelves scattered around the house, and this is one of the bookshelves in my daughter Sam's room. She and I both share a love of young adult books and the name of my book blog was actually inspired by the "reading dates" we have together. 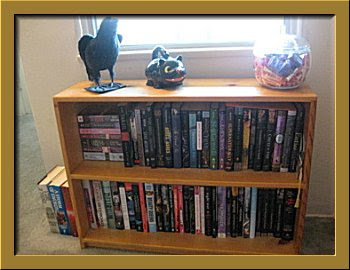 My husband is a big reader as well, and his favorite genres are thrillers and non-fiction. Here is another bookshelf in the living room. I don't keep a lot of books around though; I read on my Kindle and Nook mostly. Many times after I read books I’ll give them away or donate them to Sam's school since I don't have a lot of space to keep them around. These are my parakeets Tom (white) & Dylan (yellow) who keep me entertained with their singing and chatter. Lucy, my space is normally a bit cluttered, and I work here just fine. (I have a sneaking suspicion that many other regular readers of this feature are nodding their heads!) I love how you chose the name for your blog, too! By the time December rolls around, I'll have to have the windows shut, and I won't be able to hear the birds singing outside. It's wonderful that you have Tom and Dylan to entertain you! Thank you so much for sharing your creative spaces with us. We really appreciate your letting us take a peek! Don't forget to stop by next Wednesday when I'll be featuring another book blogger from our worldwide community. I love Dylan and Tom! I would love to have birds but it may be a bad idea with my three cats. 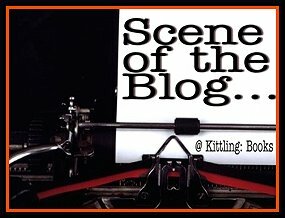 Nice to have a look at Lucy's blogging space! I love her birds. Lola - Dylan & Tom are very funny, but you're right they would be terrified by the 3 cats. Sometimes cats will jump on our windowsill next to their cage and give them a big fright! I need a swag board! Such pretty birds! How lovely to have a daughter to share your reading with. GeraniumCat - Thanks! It is nice to share books with her. She is a fast reader too, and it's nice to have her pre-screen books for me. Very awesome blogging space, Lucy! =) Is that a Buffy calendar I spy? Love it! I also love the idea of a swag board... I totally want to do something like that because I have all these cool bookmarks and postcards that basically just sit in an envelope right now. It would be much cooler to see them out and displayed. I like the idea of reading dates. I wish my husband was a reader but I don't think he'll change at 74. 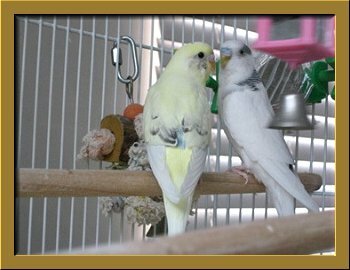 Years ago I had parakeets. The last one, Peewee, was often traumatized when my cats, Pete and Repeat, sat on the floor and stared up at him, and stared, and stared. Poor Peewee! Barbara-- Poor Peewee is right! That name may be cursed. Many moons ago my grandmother had a huge aquarium filled with goldfish. My favorite was the tiniest, and his name was... Peewee. My grandfather went to South Dakota to work on the missile silos, and my grandmother drove up there to be with him for a while. Mom and I took care of their house while she was gone, and I was in charge of the fish tank. One afternoon we went over there. I went to feed the fish, and Peewee disappeared. I never did find a body or any loose parts. Poor Peewee! Hi Ashley! Yes, you spy Giles on my Buffy calendar. Huge fan :) I'm sure you have lots of swag to fill a swag board too.